Lizzy has been with the RCD since May 2017. She grew up in the Big Sur area on an organic Meyer lemon farm in an off-the-grid, rammed earth home. She attributes many of her interests and personal attributes to her unique upbringing in coastal Central California. Lizzy holds a B.A. in Biology from Colorado College and an M.S. in Applied Watershed Science from California State University Monterey Bay. For the past ten years, Lizzy has gained experience in organic farming, rare plant mapping, invasive species management, native plant propagation, outdoor education, community-based watershed restoration, California condor rehabilitation, and geographic information system data management and analysis. 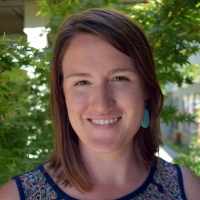 Lizzy is the RCD’s representative on the Board of Directors of Fire Safe Santa Cruz County and manages a number of watershed restoration projects. Her work is motivated by implementing low-technology solutions to address large-scale environmental problems. She is an avid hiker, long-time potter, enthusiastic succulent propagator, devoted gardener, amateur ornithologist, mediocre rock climber, and a budding paddle boarder.